This one was also made last night and after the dance of the star. Thanks to this little gem I went to bed later than expected but the result is just so cute :) I just love the way it ended. The photo is too dark but believe my word when I say the result is cute! This モザイクボックス　was made from regular wrapping paper (printed on the other side). 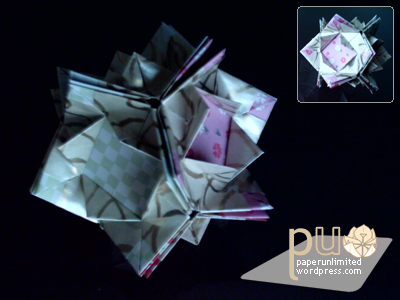 The paper was 14×14 cm and this kusudama is 6.5×6.5 tip to tip, the cube is 4x4x4 cm. For this kusudama you need 6 square sheets: 12×12 and bigger sizes are good to fold. This entry was posted on 2007|01|30 at 16:06 and is filed under kusudama, modular origami. You can follow any responses to this entry through the RSS 2.0 feed. You can leave a response, or trackback from your own site.